Life has been a whirlwind of activity before, during, and after the launch of STS-135. As they often say, “The best laid plans of mice and men often go astray,” could never be more true. Live streaming worked great for STS-133. Not a glitch and had no network connection issues. The same could not be said for sts-135. Take 1 million people (Yes, I said it, 1 million people) scattered, or in some cases elbow to elbow, in a small geographic area like the Space Coast with everyone Tweeting, calling, capturing video, etc. and the strain on the cellular towers just couldn’t take it. I’ll take pause here. Watch the magnificence of the final flight of NASA’s Space Shuttle Program as Atlantis, STS-135 carries three men and one woman riding on a rocket into space. I lost all cell communication at 9:05 am just as I approached the security checkpoint heading to Kennedy Space Center. There was a group of Space Tweeps already there but with no phone signal I could only walk around KSC and hope to find them. I settled for a nice spot near the Astronaut Memorial right next to a jumbo screen keeping a close eye on Atlantis as she sat on the launch pad waiting to lift off and listening to Mission Control at Johnson Space Center which was as exciting as waiting for liftoff itself. KSC was not as crowded as some of the other viewing locations, particularly Space View Park where I originally planned to watch Atlantis take to the sky. The notion of arriving at around 5 pm the day before launch without a tent, a tarp, a rain poncho, or any place that I could sleep became less and less of an attractive option. Much love and appreciation to @mgrabois who gave me a badge to KSC with my only desire to get the envelope post marked on launch day and mailed to me. Unlike the Tweetup and all of the special attention we received from NASA, viewing on your own was a different story. Some of us secured causeway tickets, others had special invites to view from places like the Astronaut Hall of Fame, and some just played it by ear. The fortunate STS-135 Tweetup folks got an up close and personal view and experience at the press site but their encounter included a slew of press and other people who came to see, record, and disseminate information on the final launch of America’s space shuttle program. Nevertheless it was history in the making and the last time we would see these magnificent space vehicles take flight. For those of us without tickets there were plenty of places to watch a shuttle launch. The previous evening we had driven out to the Airforce base and noticed a long stretch of road with the perfect view to watch the launch, not as close as the press site but nonetheless a great spot to see Atlantis rise into the air. We got out of the car and spent some time just looking at Atlantis all lit up on the launch pad and reflecting that this would be the last time an orbiter would be in that position and on launch pad 39A. We’ve seen them all, Discovery, Endeavor, Challenger, and Columbia, and Atlantis launch countless numbers of time into space. America mourned the tragic losses in the Challenger and Columbia tragedies but it reminded us of a fact that @AVClubVids has said often and presented in a SpaceUp San Diego Conference talk that space is dangerous. Listening to astronauts talk about their feelings on launch day solidifies this fact. Yet, many of us took the space shuttle program for granted and many argued that it was a colossal waste of money and manpower. What is was in reality was an opportunity for man to reach for the stars. Perhaps we didn’t work hard or fast enough, as we had done in the past, to make the dreams of space exploration beyond low Earth orbit a reality. Maybe we became complacent in our own arrogance that not only had we conquered space travel and landed on the Moon but we were the Masters of the Universe. Perhaps it is the sense of taking a risk to do something that many people would easily take a pass on is what sets astronauts apart from the rest of us. As Atlantis ended her mission, people were heard to say that NASA was shutting down. So far from the truth and perhaps in a way many of us don’t quite understand yet it may be just the shot in the arm NASA needs. There are so many missions in space right now that just like the space shuttles people have ignored. After all, who but oceanographic and Earth scientists would care about an instrument, Aquarius, in space that measures the amount of salt in the atmosphere? Or a mission to Jupiter, Juno, that will reveal many undiscovered facts and open up a whole new conversation on the gas giant. Grail is going to study the Moon and later this year the biggest and baddest Mars robotic rover, Curiosity, will launch to give us a more thorough and in-depth investigation of what lies on Mars following in the footsteps of Spirit, Opportunity, Phoenix, and Pathfinder. In order to find out what’s out there we have to explore and we’ve been doing that sort of in the dark from the eyes of the public as you really have to have a love for space to follow what NASA has been doing everyday for more than fifty years. It doesn’t matter if the space shuttle program was what brought you into the fold or you have been a space/astronomy/astrophysicist geek for sometime, the fact that you have caught the bug is all that counts. I have taught space science and immersed myself in all things NASA for many years and until the STS-133 launch I never gave much thought to the possibility that I could one day go into space. The Zero-G flight was incredible experience and one that I considered would be the closest I’d ever come to really being in space. After hanging around orbiters, shuttle launches, robotic rovers, rockets, and other liked minded people who believe in human nature and the power of innovation did have a profound effect on me. We often talked about how the Tweetups were a life changing experience and many of us have blogged about it. For me it was not only a life changer but a mind changer as well. While I have always had a deep appreciation of Planet Earth, I began to view what I did everyday in an entirely different light. The shuttle launches for me became a head clearer, looking at the ordinary that I had taken for granted and beginning to see it as the extraordinary. This is a blog post in itself and one that I will sit down and craft soon. 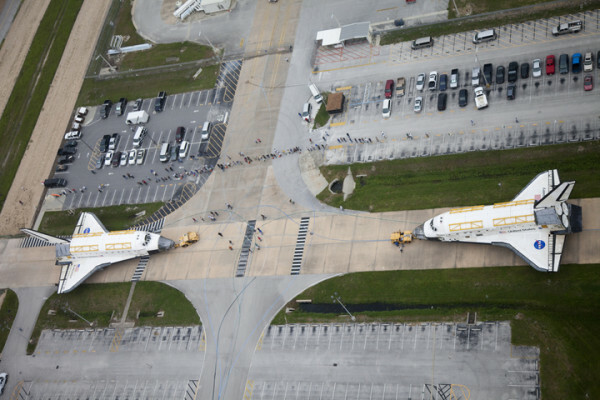 In the meantime, as the orbiters are preparing to make their final journey into museums, spend a few moments to live in the moment of two orbiters on a path of similar destiny.